Some people (regardless of age!) have the genetic potential and the personal motivation to pursue competitive bodybuilding. The major objective in bodybuilding is to develop larger muscles. The benefits from this include increased metabolism (since muscle cells burn more energy than fat cells) which makes it easier to maintain a healthy weight, more vitality, and increased appeal to your partner or potential partners. 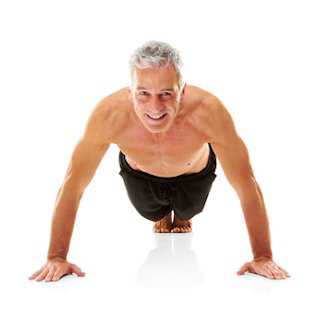 The workouts to achieve this goal can be very demanding, and might include (among many other exercises) pushups and curls, such as the gentlemen pictured here are doing. Bodybuilders typically perform 4 to 6 sets of 8 to 12 repetitions each, with only a brief rest (15 to 45 seconds) between sets. 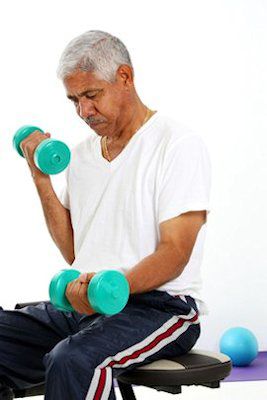 In addition, they'll perform between 3 and 5 different exercises for each muscle group. Since bodybuilding routines are very demanding in terms of time and energy, a bodybuilder might follow a six-day training schedule. For example, they might train their legs, low back, and abdominals on Mondays and Thursdays, their chest, shoulders, and triceps on Tuesdays and Fridays, and their upper back, biceps, and neck on Wednesdays and Saturdays. 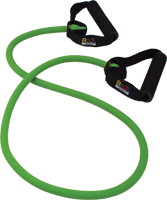 This would provide ample rebuilding time for each muscle group. If you have the motivation, dedication, and potential to be a competitive bodybuilder in your age group, you could possibly achieve a body that looks like this.